Use the printable FAFSA application to enter data online or print a FAFSA form. The official 2019 - 2020 FAFSA application for financial is available, as is the 2018 - 2019 FAFSA. Always submit the earliest as possible for the best chance of receiving college financial aid. The application is available on October 1 each year (October 1 2018 for school year 2019-2020). 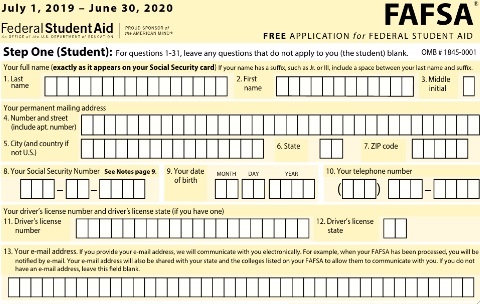 I think the best way to start your FAFSA application for federal student aid is to print a FAFSA form. Although most people submit the FAFSA financial aid form online, it is very important to not make any errors. Most people make fewer errors when they proofread a paper copy instead of viewing online. The form can be confusing, especially since it assumes the student is filling out the form when in many cases it is the parent. One nice feature of the printable FAFSA form is you can fill in the form online before you print it. This makes it easy to check once it is printed. I like to use a colored highlighter pen to highlight the items that need further clarification, such as the net worth of investments. There are over a 100 questions in the printable FAFSA form and the form is color-coded, and the color changes each year. The form is divided into seven (7) sections. Sections one, two, three, five and six pertain to the student and are yellow-colored questions for 2019-2020 (blue-colored questions for 2018-2019). Section four pertains to the parent(s) and is colored in purple. Finally, section seven pertains to both the student and the parent(s) where both need to read, sign, and date the form. Or, you may find them in paper form at your local library or financial aid office by mid-January. Otherwise, you may call (800) 433. 3243 to request the paper form to be sent to you by mail. You may submit your FAFSA application beginning October 1st of your student’s senior year in high school, and a new one must be submitted each year. 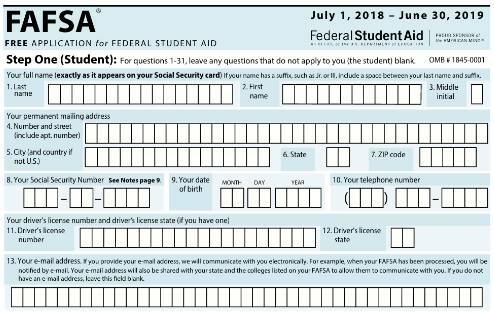 The form must be received by the Federal Student Aid Office usually by the end of June, but earlier is better. To be eligible for state financial aid, the application must be submitted by earlier deadlines. See the list of FAFSA Deadlines for each state. It is advised that you make a copy of your application before you sent it. After your application is processed, the Federal Student Aid Office will send you a summary of your information in a report that is called Student Aid Report or SAR.